Perfect for mixing saltwater aquarium supplements and trace elements. Fits perfectly in our Mr. Chili Mixing Jug. With a 100 mm diameter at the top and a 25 mm opening at the bottom dry chemicals flow through the funnel without clogging or making a mess. You will not catch us mixing 2 part solutions without a funnel on hand. Essential reefing tool for pouring both wet and dry materials. fits chili mixing jugs, works perfect. Works great for putting salt into my phyto bottles. I tried to avoid using a funnel - mistake <grin>. If you're mixing in jugs, this funnel makes it super easy. And it works! I would be surprised it it didnt. this is perfect for loading my BRS reactors, GFO.. carbon doesn't matter no clogging and easy to clean. I bought an extra funnel for the the two part dosing system. I like being able to use one for the powders and one for the RO/DI water. Couldn't be happier. I think i have 3 of t hem now. 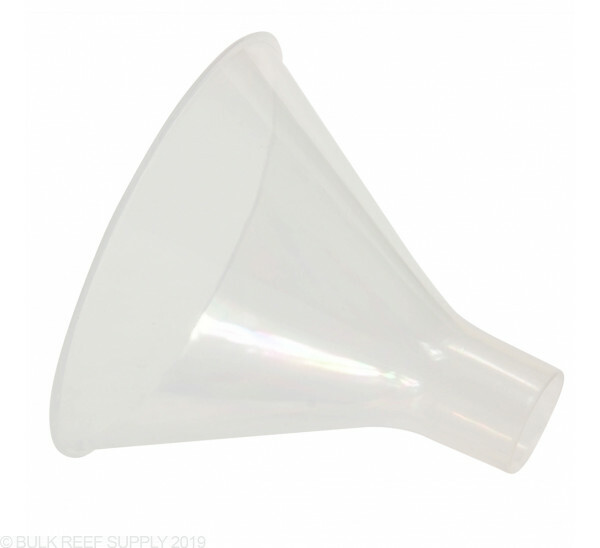 This is a great funnel for 2-part, nice wide opening at the bottom so you dont have to worry about clumping powder and using some kind of stick to force it thru the funnel. Makes it easy to add the powders to 1 gal jugs without spilling.